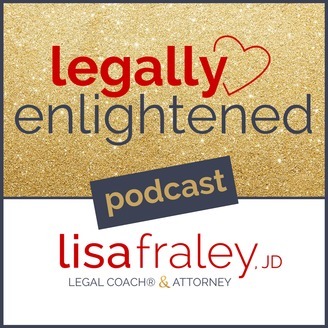 The Legally Enlightened podcast helps to make law, life and YOU feel a little bit lighter and brighter. 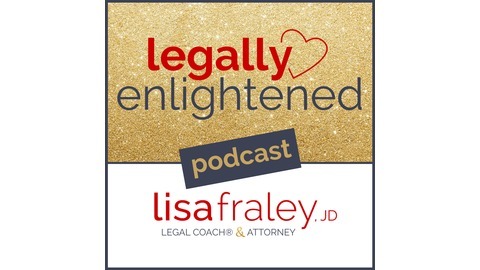 Lisa Fraley, an Attorney, Holistic Health & Life Coach, Speaker & Best-Selling Author shares bite-size legal tips – in 20 minutes or less! - so you can feel safe, secure, confident and empowered as you grow (with grace!) in business and life. From trademarks to LLCs to disclaimers and more, Lisa deconstructs the law into plain English and adds a dash of spirituality, love and heart to share mini-legal tips and actions you can take to protect your business and brand – with a lot of Legal Love. Have a legal topic or question that you’d like Lisa to talk about? Share it at clientlove@lisafraley.com. EP61: Laura Belgray on 3 Tips for Writing "Words That Sell"
I welcomed copywriter Laura Belgray to the podcast to share 3 practical tips for how to write e-newsletters, sales pages and opt-ins in a way that makes people actually want to take action after reading your work. Laura’s known for teaching you how to write “non-sucky”, swipe-worthy copy using strategies like “the Stephen Spielberg test”. In this episode, Laura explains how to add more visual details to your writing to bring in flair, style and, your unique personality so you can generate sales through the intentional use of words. I have such respect for Laura’s talent. She helped me with my own website copy, and I had the pleasure of eating fuscilli pasta and mint gelato with her at her 3-day writing workshop in an ancient castle overlooking the Italian sea. Laura Belgray, founder of Talking Shrimp and co-creator of The Copy Cure, is a copywriting expert who helps entrepreneurs find the perfect words to express and sell what they do. Through her her work with hundreds of clients (including online biggies like Marie Forleo, Mastin Kipp, Amy Porterfield and Kate Northrup) she’s seen firsthand that putting “you” into your copy is pure magic for getting people to love you up, share your ideas, and happily click your “buy now” button. Laura’s list of clients and credits include NBC, Bravo, HBO, TBS, Fandango, and many, many more. So if you watch TV -- and don’t skip the commercials -- you just might see her words on air. Free Gift:Download Laura Belgray’s free gift – “5 Tips for Non-Sucky Copy” - to learn more about how to write copy that converts to sales at http://talkingshrimp.com/secrets. Resources:Easy Legal Steps - download the first book chapter free! Do you have questions about copywriting? Feel free to reach out to us at clientlove@lisafraley.com. We’re always happy to help you however we can and help point you in the right direction, whether we can help you specifically or whether we refer you to another attorney.